I will be giving a public talk on social enterprise at the Faculty of Law, University of Manitoba Tuesday March 31, 2015. I am delighted and honoured to learn that I am being recognized as one of the “50 Most Talented Social Innovators” by the World Corporate Social Responsibility (CSR) Congress in Mumbai, India on February 18, 2015. The theme of the Congress is “Connecting Minds: Creating the Future”. The “50 Most Talented Social Innovators,” as awarded by a jury, pays tribute to those who are missionaries and passionate about innovation and who believe that innovation must contribute to social change are recognized. Visiting Mumbai and meeting other activists at the conference will give me a chance to talk about my hands-on work in Winnipeg, and my policy work in Canada – and hopefully raise the profile of Inner City Renovation: How a Social Enterprise Changes Lives and Communities, as well! A number of Universities including Cape Breton University, Canadian Mennonite University, Arcadia University and University of Winnipeg are using “Inner City Renovation: How a Social Enterprise Changes Lives and Communities” as a text in their business schools and or community economic development programs. The book was published in 2013 by Fernwood Publishing and has already sold nearly 2000 copies. Social Enterprises are a positive response to complex social issues and driving force for local economic development. WEC is hosting a national conference in Toronto September 10 and 11. I have agreed to deliver the keynote address highlighting the opportunities and challenges related to starting social enterprises and other CED enterprises. WEC is a non-profit national organization that supports women’s organizations and women in using CED (social enterprises; Co-operatives; business) to gain economic security for their organizations and themselves. A video on supported social enterprises is being produced in Winnipeg July 10 -13, 2014. The video is part of a project coordinated by the Social Economy Centre and the Centre for Learning, Social Economy and Work, both at University of Toronto. Social Enterprises that will be featured in this video include ImagineAbility, B.U.I.L.D., Inner City Renovation, Aki Energy and Diversity Foods. The video should be available on the web in September 2014. Shaun Loney, Executive Director, B.U.I.L.D is one of three finalists for the Ernst and Young, 2014 Entrepreneur of the Year (Prairie Region) Awards. 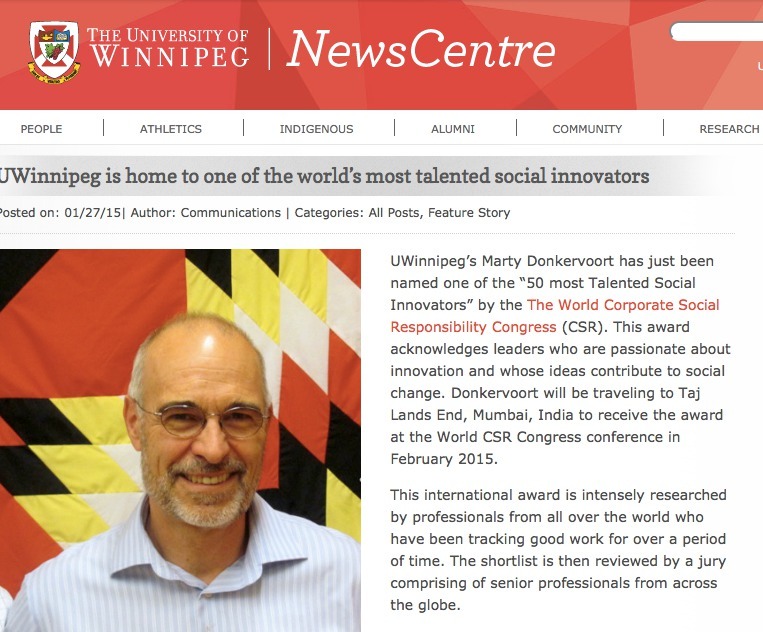 He has been cited in the social entrepreneur category. BUILD is a social enterprise, non profit contractor in energy retrofits. It is a training program for people facing barriers to employment.